We followers of Terrafugia's Transition project have been holding our breath of late, sure that a test flight of their roadable airplane was imminent. Emails and other communications from people associated with the project have been hard to come by lately, when before they were quick to reply to any correspondence. This silent treatment for much of March led me to believe that (a) the plane did fly but there were really serious problems they did not want disclosed, or (b) it had not flown yet. Turns out the Transition DID fly successfully on March 5th, and they were just holding cat in bag until today's press conference in Boston. 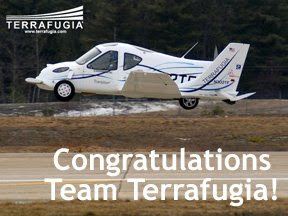 It is with great pleasure that we make the following announcement: TheTerrafugia Transition® Roadable Aircraft Proof of Concept successfully completed its first flight at Plattsburgh International Airport in Plattsburgh, NY on March 5, 2009. The Transition® lifted smoothly off of Runway 17 in the early morning light. The first flight was conducted within the runway environment and demonstrated the aircraft's stability and controllability. After 37 seconds, Col. Meteer executed a smooth landing and taxied safely to a full stop. The flight comes after six months of drive testing and taxi testing. Following a successful full vehicle inspection, flight testing continued with six additional flights proving out the vehicle's aerodynamics and smooth handling characteristics. "This flight is a symbol of a new freedom in aviation. It's what enthusiasts have been striving for since 1918," says Carl Dietrich, CEO of Terrafugia. The Transition® was flown by Phil Meteer, Colonel, USAFR (Ret). The chase aircraft was piloted by Giora Guth. Said Col. Meteer: "The first flight was remarkably unremarkable. 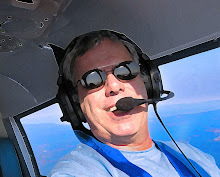 I've flown several thousand hours in everything from Piper Cubs to F-16s and the Transition® flew like a really nice airplane." The Transition's stability and controllability in flight were demonstrated in a series of initial flights following the first takeoff and landing. Now that the concept has been proven, the Terrafugia team will begin the process of adapting the lessons learned from this vehicle to the design of the next prototype. Footage and video of the flight testing as well as comments from the test pilot are now available through www.terrafugia.com. The Transition® will temporarily be on exhibit at the Museum of Science, Boston on March18, 2009. Current plans call for the Transition® to be on exhibit at Sun N Fun in Lakeland, FL and at AirVenture in Oshkosh, WI. Please see www.terrafugia.com/events.html for the most up to date listings. I want to take this opportunity to acknowledge the people who have brought us to where we are today. The Terrafugia Team consists of an outstanding group of engineers and business leaders with backgrounds ranging from the MIT Department of Aeronautics and Astronautics to big aerospace companies like GE, Northrup-Grumman, and McDonnell Douglas (now Boeing),to a small Massachusetts electric vehicle startup company like Solectria, from Draper laboratories to Arthur D. Little, and from the insurance industry to the competitive sailing industry. You could not ask for a better team to develop this type of technology. This fantastic team would have not been able to accomplish what we have without the continued support of our network of investors and advisors. This milestone is as much a cause for celebration for them as it is for us. These diligent individuals understand that the current mix of new technology and perfect timing has created a significant opportunity for Terrafugia. I want to take this opportunity to thank our corporate sponsors, SolidWorks and Cable Organizer.com who reached out to Terrafugia even before our vehicle concept was proven. I also want to thank our corporate partners from the aviation industry who have supported our development program with in-kind assistance: Garmin, Bose, Icom, David-Clarke, Telex, CO Guardian, Aloft Technology, Plane Sights, and Dynon Avionics. Our company would not be on the path to success without the support of our friends in the aviation industry: Lockwood Aviation, Willis Aviation, USI, Ballistic Recovery Systems, Air Graphics, Plattsburgh International Airport, Sheltair Aviation Services, Lawrence Municipal Airport, Laurence G. Hanscom Field Airport, Freedom Aero Credit, Aviation Capital Experts, the Aircraft Owners and Pilots Association, the Light Aircraft Manufacturers Association, the EAA, and in particular our local chapter, EAA 106. Finally I would like to thank the regulators who have been patiently working with us for the past few years -- in particular, our friends at the FAA, the National Highway Traffic Safety Administration, the EPA, the Massachusetts Registry of Motor Vehicles, and the Division of Insurance. Most importantly, thank you to our customers. We look forward to delivering a fantastic product! So congratulations to these brilliant people, they deserve this. I have met them at Oshkosh, and they are some of the nicest pilots and executives you will meet in this industry. I plan on seeing them again this summer at the EAA Annual Wisconsin Airplane Show and Brat Festival at KOSH, but I suspect there will be quite a line at their booth. UPDATE @ 1253P ON 03.18.09: A photo gallery of the Terrafugia press conference held just hours ago can be found here. And my Google News Alerts app is showing one story coming up on the web about every 5 minutes...great news. Finally, the world and the media can take this project seriously.